The theory of infinite dimensional dynamical systems is a vibrant field of mathematical development and has become central to the study of complex physical, biological, and societal processes. The most immediate examples of a theoretical nature are found in the interplay between invariant structures and the qualitative behavior of solutions to evolutionary partial differential equations (PDEs) of parabolic or hyperbolic types. Insight has also been gained from the theory of infinite dimensional dynamics into the solution structure for nonlinear elliptic equations, including those arising in geometry. Other important and general topics, besides PDEs and dynamics in abstract spaces, addressed by the theory of infinite dimensional dynamical systems, include delay differential equations, lattice dynamics, and evolutionary systems with spatially nonlocal interaction. The IMA will select up to 8 postdoctoral fellows to participate in the program. The theory of infinite-dimensional dynamical systems is a vibrant field of mathematical development and has become central to the study of complex physical, biological, and societal processes. The most immediate examples of a theoretical nature are found in the interplay between invariant structures and the qualitative behavior of solutions to evolutionary partial differential equations (PDEs) of parabolic or hyperbolic type. Insight has also been gained from the theory of infinite-dimensional dynamics into the solution structure for nonlinear elliptic equations, including those arising in geometry. Other important and general topics, besides PDEs and dynamics in abstract spaces, addressed by the theory of infinite-dimensional dynamical systems, include delay differential equations, lattice dynamics, and evolutionary systems with spatially nonlocal interaction. Parallel to these developments is a blossoming of activity in stochastic or random dynamics, with new results on invariant manifolds, global attractors, and invariant measures for such systems. Random events occur in the physical world and throughout our everyday experiences. Taking stochastic effects into account is of central importance for the development of mathematical models of complex phenomena under uncertainty arising in applications. Macroscopic models for these systems contain randomness in many ways, such as stochastic forcing, uncertain parameters, random sources or inputs, and random initial and boundary conditions. The theory of random dynamical systems and stochastic differential equations provides fundamental ideas and tools for the modeling, analysis, and prediction of complex phenomena. 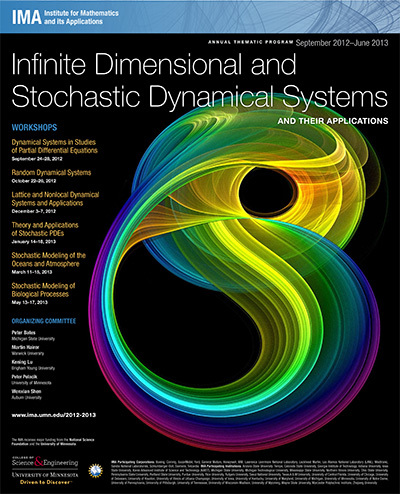 A large proportion of the thematic year and the workshops will be devoted to the theory and application of stochastic dynamics. Some of the applications for these systems include, but are not limited to neuronal firing and other cellular processes, subject to and even relying upon Brownian perturbations for optimal performance; molecular motors and self-assembling bio-molecules; materials science and propagation of waves in random media; oceanographic and atmospheric systems; interacting particle systems related to non-equilibrium statistical mechanics; electronics and oscillations in imperfect lattices; financial mathematics; quantum mechanics; genetic regulatory networks; and coherent and localized structures in fluids and chemically reacting systems. Computational approaches will also be well represented in all workshops.